Learn the fundamentals of BlockChain technology from Don Tapscott and Alex Tapscott, popular experts in business innovation and technology. Become future ready by learning the technology which is already a big thing and going to rule the business world online. Who are Don Tapscott & Alex Tapscott? This specialization consists of 4 courses, each covering the various aspects of Blockchain technology. The entire content is 100% online, there is no need to attend classes in person. Just select your schedules and start learning! Learners can finish the specialization in one month If they can spare 15 hours/week. Though, you have all the liberty to set your schedules and complete it as per your schedules. What do you get after completion? After completion of this specialization, you will able to ​establish and execute blockchain technology within your own enterprise or organization. You also get a certificate of completion upon successful completion of this specialization. Not to mention how much is the value of a Coursera Certificate. 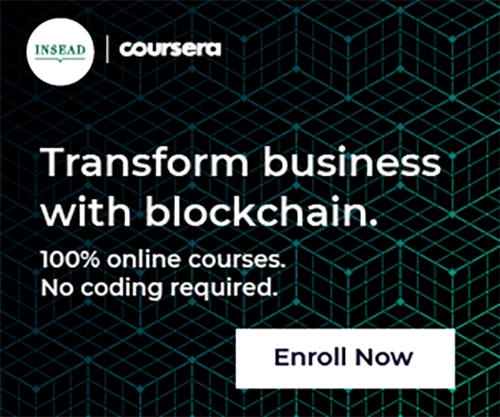 Therefore, if you are looking to learn everything about Blockchain technology, consider looking at this Specialization from INSEAD today!